The Omer is the period of 49 days between Pesach (Passover) and Shavuot. Through counting the Omer, we link liberation with revelation. Once we counted the days between the Pesach barley offering and the Shavuot wheat offering at the Temple in Jerusalem. Now as we count the days we prepare an internal harvest of reflection, discernment, and readiness. 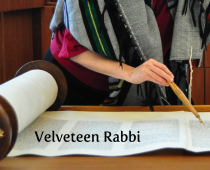 Kabbalistic (mystical) and Mussar (personal refinement) traditions offer lenses through which we can examine ourselves as we prepare ourselves to receive Torah anew at Shavuot. Here are 49 poems, one for each day of the Omer, accompanied by helpful Omer-counting materials. Use these poems to deepen your own practice as we move together through this seven-week corridor of holy time. New: Now available as an e-book for $6. Or if you buy the paper book, you can get the digital version for $1. Rachel Barenblat has gifted her readers with a set of insightful poems to accompany our journey through the wilderness during the Counting of the Omer. Deft of image and reference, engaging and provocative, meditative and surprising, this collection is like a small purse of jewels. Each sparkling gem can support and enlighten readers on their paths toward psycho-spiritual Truth. Your Torah is transcendent and hits home every time.